I love it when bands reference geographic points. Whether its Rocky Top, Tennessee or John Denver’s country roads, the more musically inclined geo-nerds like myself will argue about the exact location that the artist specified. It’s arguable that, in music, even the most specifically referenced geographic points are more or less states of mind than specific locales. Sweet Home Alabama could really exist anywhere, if you want it to. Y’all know what I mean? Esmeralda County in Nevada, of some 700 or so people, is sandwiched right in the middle of the Nevada and Californian deserts (and even borders Death Valley National Park at its southernmost point). The county seat is the former boomtown, Goldfield, hardly bustling much anymore with a population south of 300. In fact – thanks to a little wiki research – Esmeralda apparently is the second least densely populated county in the country (this side of Loving County, Texas, which I visited back in February). So Flowers is right – this place really is quite lonely. While plenty of Killers fans (especially west-coasters) might want to hitch a ride out to Esmeralda for a photo op with the county sign, it bears import (well, it doesn’t, but to me it does) to figure out exactly which part of the county line Flowers is concerned with. As the album was recorded in Las Vegas (the band’s home), and earlier in the song Flowers states he was “driving through the desert last night” as Elvis’s “Don’t Be Cruel” blared in the background, the most obvious answer would be that our narrator headed up US-95 from Vegas, cutting into Esmeralda and riding north along the line all the way up to Tonopah, Nevada in Nye County. The problem is, Flowers might never have cut into Esmeralda. It seems that Flowers was “outside” the county line when his emotions got the better of him. Whether he kept going into the county isn’t known from the lyrics. Another problem is that if Flowers did take this route, he’d be driving for quite awhile as it’s 3 1/2 hours just to get to Tonopah. An easy daytime drive, yes, but not exactly the smartest endeavor while dealing with emotional distress in the dark of night. 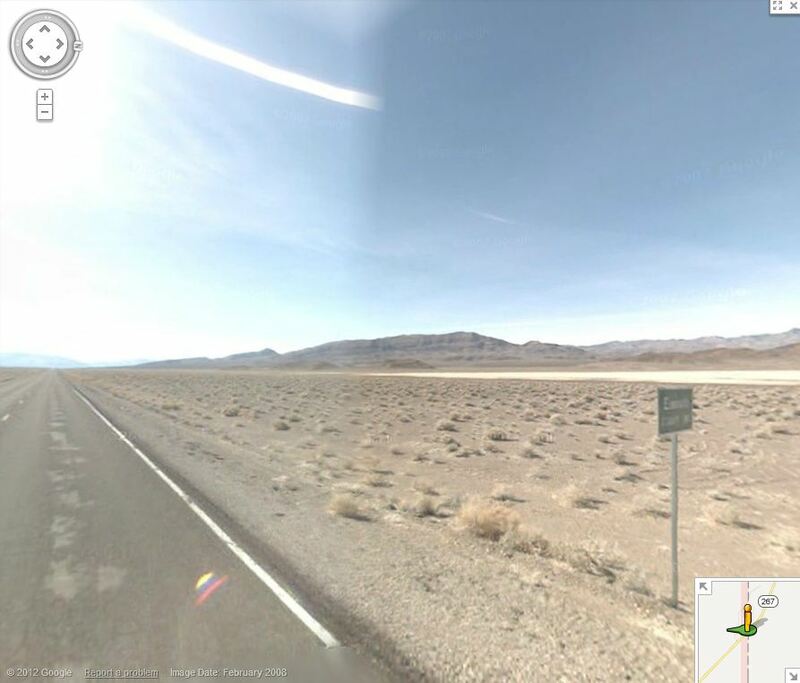 Another idea – as seen in the photo above, is that Flowers took the “scenic” route and cut off US-95 onto Nevada 267 towards the southern corner of Esmeralda and Death Valley. That would certainly be the loneliest of lonely corners, at least until Killers fans make that their personal roadside attraction. Not at all depressing, the desert inspires. Great for contemplation, which is I believe what Mr. Flowers is going on about. I’ve been to all the paved roads (and a few unpaved) of Esmeralda County, all those corners! It’s my favorite county, and Lida Summit is my favorite place!